What exactly are the legalities behind DUI sobriety checkpoints? How is this an OK strategy for law enforcement to implement, and what does the Supreme Court have to say about this tactic used to catch drunk drivers? In today’s blog post, you’ll learn the answer to these questions and more, as sobriety checkpoints are legal in the state of Ohio. If you find yourself in the middle of a DUI case, get a DUI lawyer in Columbus you can trust. Our knowledgeable and experienced DUI lawyer, Michael Probst, can provide you with effective legal counsel for your case. Not sure if you need a DUI lawyer or not? Learn more in this blog post, and/or contact Probst Law Office, Inc. today for a case evaluation. In general, police officers do not have the right to stop a vehicle unless it’s believed that the driver has committed a crime or has violated a traffic offense. In fact, the Fourth Amendment protects individuals by only allowing searches and seizures that are “reasonable.” So, generally speaking, police can only search your car legally if they have a reasonable suspicion that you broke the law. That leads to the ultimate question: what makes DUI sobriety checkpoints different? During a DUI checkpoint, police stop every car and every driver, meaning they detain drivers without having any reasonable suspicion that the driver broke the law. Of course, keep in mind that the legality of a DUI checkpoint can be circumstantial and that there are cases where DUI checkpoints are unlawful, which we’ll explain further below. There are certain situations where a DUI checkpoint can go from being totally legal to illegal. For example, if police detained you for an excessive amount of time or searched the inside of your vehicle without any evidence of impairment on your part, a court of law could determine that the stop went beyond what is normally considered reasonable. 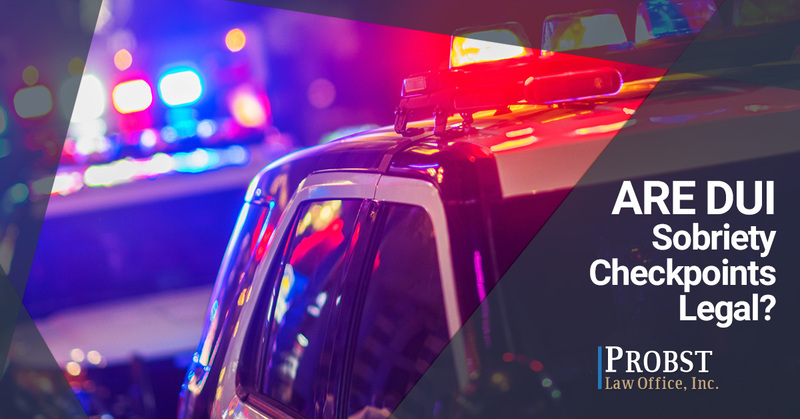 If you received a DUI from a checkpoint and aren’t sure if your situation was legal or not, reach out for legal assistance from our experienced DUI lawyer. When you’re charged with an OVI/DUI, whether it’s your first time or you’ve had multiple charges, you should seek the professional help of a DUI lawyer for your defense. At Probst Law Office, we can help you protect your freedom and find a defense that best benefits your future. Learn more about types of defenses that can be used against an OVI/DUI here, and call Michael Probst at (888) 223-3741 today to schedule a case evaluation. You can also fill out our online form at your best convenience and we’ll get back to you as soon as possible.